The 1980 Arizona Groundwater Code recognized the need to aggressively manage the state’s finite groundwater resources to support the growing economy. Areas with heavy reliance on mined groundwater were identified and designated as Active Management Areas (AMAs). 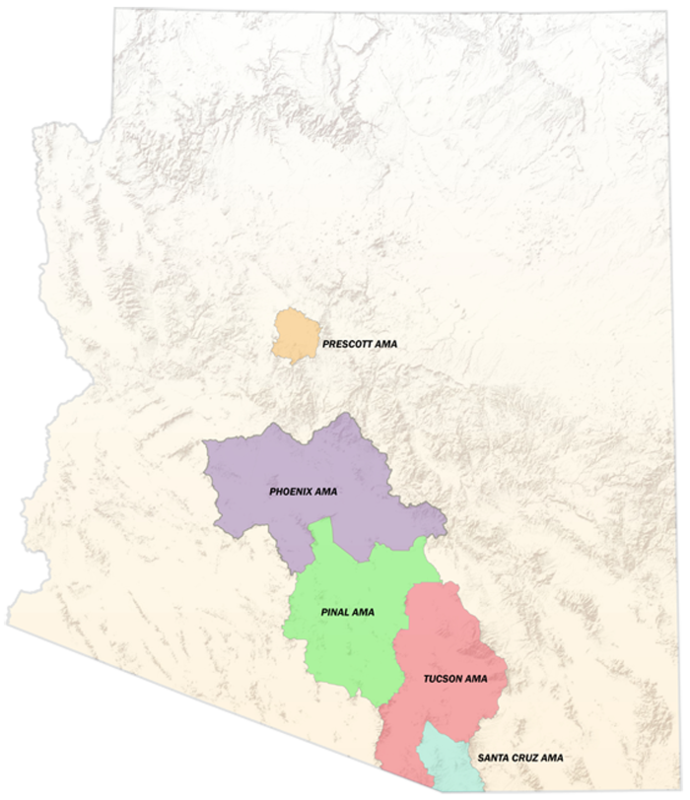 The five AMAs (Prescott, Phoenix, Pinal, Tucson, and Santa Cruz) are subject to regulation pursuant to the Groundwater Code. Each AMA carries out its programs in a manner consistent with these goals while considering and incorporating the unique character of each AMA and its water users. In the Phoenix, Prescott, and Tucson AMAs, the primary management goal is safe-yield by the year 2025. Safe-yield is accomplished when no more groundwater is being withdrawn than is being replaced annually. In the Pinal AMA, where the economy is primarily agricultural, the management goal is to preserve that economy for as long as feasible, while considering the need to preserve groundwater for future non-irrigation uses. In the Santa Cruz AMA the management goal is to maintain a safe-yield condition in the Active Management Area and to prevent local water tables from experiencing long-term declines. To assist in achieving the AMA management goals, a series of five management plans are to be prepared between 1980 and 2025 for each AMA. These plans contain progressively more rigorous management requirements for agricultural, municipal and industrial water users. Management plans for each Active Management Area reflect the evolution of the Groundwater Code, moving Arizona toward its long-term water management goals. The plans include mandatory conservation programs for all persons withdrawing, distributing or receiving groundwater designed to achieve reductions in withdrawals of groundwater. Each AMA has a five-member advisory council appointed by the Governor as established by the Groundwater Code. Members are appointed for six-year terms to represent groundwater users in their respective AMA. Each Groundwater Users Advisory Council provides advice and recommendations to the AMA Director on groundwater management programs and policies within the AMA. The 1980 Groundwater Management Act established two initial Irrigation Non-Expansion Areas - the Joseph City INA and the Douglas INA. The Harquahala INA was subsequently created in 1981. INAs carry restrictions on bringing in new irrigated acreage & all owners of irrigation groundwater withdrawal authorities must report their water use to ADWR if the water was used during the calendar year. The three INAs are administered by ADWR AMA staff.